Delaney is set to take up a position as the FAI’s Executive Vice-President. 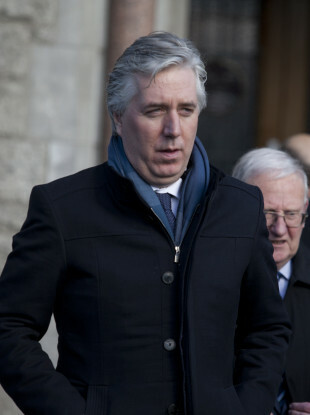 MINISTER FOR FINANCE and Public Expenditure Paschal Donohoe believes John Delaney must clarify what his new role will entail before the FAI appoints his successor. The association confirmed on Saturday that Delaney would step down from his role as its chief executive after 14 years to take up a position as its Executive Vice-President. The FAI is hoping to confirm its new CEO at its AGM in July, but Donohoe called for Delaney to clarify what his new responsibilities would be before then. “I think anybody who is looking to apply for that job in the future, anybody who has an interest in what the future governance of Irish soccer is going to be, will require clarity on his future role,” the Minister told Today with Sean O’Rourke on RTÉ Radio 1. Although the association said Delaney would take a pay cut in his new position, Donohoe said how the role will be funded is something that “will need to be answered”. “Many people involved in [League of Ireland clubs] or amateur sports will have questions surrounding the future of this role and what the future costs will be,” he said. The Minister’s comments follow a week when Delaney came under pressure after revelations of a €100,000 loan provided to the FAI two years ago came to light. The Sunday Times revealed last week that Delaney had provided a loan to the FAI due to a cashflow issue arising within the association. It is understood that a complaint has been submitted to the Office of Director of Corporate Enforcement in relation to the payment. A subsequent report in The Sunday Times yesterday also claimed that the association paid €3,000 a month in for Delaney to rent in a property in Wicklow. Delaney and other representatives from the association are due to appear before the Oireachtas Sport Committee next month. With reporting from Aaron Gallagher. Comments have been closed. Email “Paschal Donohoe says John Delaney deserves 'due process' - but says funding of new role needs clarity”. Feedback on “Paschal Donohoe says John Delaney deserves 'due process' - but says funding of new role needs clarity”.